Glycerol is also known was glycerin. Glycerol is a clear liquid with a viscous consistency. ("Viscous" means very thick e.g. flows more like treacle than like water - but the term "viscous" conveys no information about colour or transparency). Glycerol can be produced by hydrolysis of fats and mixed oils, e.g. as a by-product in the manufacture of soap. 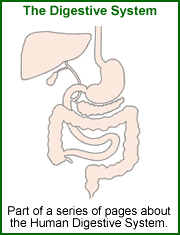 For further information see also our pages of books about gastroenterology.